Set the Download rate and Upload rate. By default, the Download rate is 50 KB/s and Upload rate is 10 KB/s. Click OK when it is done. 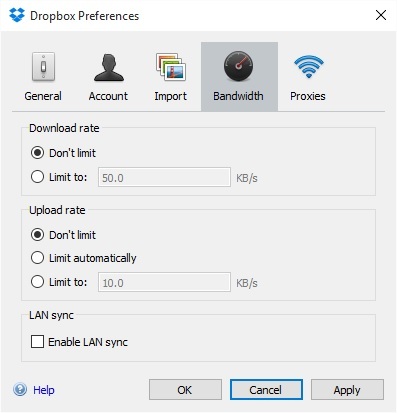 Vice Versa you feel Dropbox is syncing too slow, don't limit the Download and Upload rates. This features gives you more control on your computer's network bandwidth. your site might really be helpful for the people having problems like mentioned in the article .Dropbox nowadays is really important and thanks for your help with showing us more features of it. your site is really helpful.